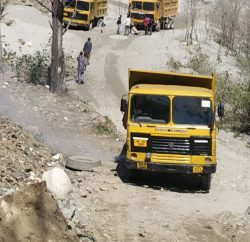 To check illegal mining activities in the State, Himachal Pradesh government has decided to impose a blanket ban for a short period of three months for transportation of construction material i.e. sand and grit to the other States. 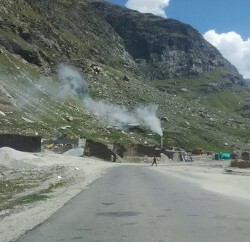 It was revealed by the Chief Minister Virbhadra Singh, in a high level meeting, which was convened to check illegal mining along state border. Chief Minister believed that this short term ban would help in meeting out the construction material requirements within the State. He said that a task force would be constituted in each district to check not only the illegal mining but also to suggest ways and means to stop these actives in future. He said that the task force would constitute local administration, police, forest and mining staff. Chief Minister said that stringent action would be taken against smuggling of construction material to outside the State and the vehicle would be confiscated. He directed concerned officers to take up the matter regarding filing early reply to waive off the restriction of National Green Tribunal for carrying out mining activities or removal of sand from river banks in the State. He said that recently the State Government had formulated its ‘Himachal Pradesh Mineral Policy-2013’ to regulate the mining activities in the State in a systematic and scientific manner and to protect the environment. Virbhadra Singh said that mining material was required to develop infrastructure in the State and housing needs of the people, thus proper mining activity should be ensured. He said that in order to check illegal mining bar-coded colourful ‘M-form’ would be made available by the Government to all the lease holders in the State. He asked all the concerned officers to inspect all the vehicles carrying construction material in the State without any indiscrimination. Chief Minister asked the Revenue and Forest Departments to check the illegal mining activities on their own land being the constodium. He said that Government has authorized 39 officers and officials of different departments like Industries, Revenue, Police, Forest, I&PH, PWD and Block Development Officer to make complaints in writing in the Court of competent jurisdiction with respect to any offence punishable under the Mines and Minerals (Development & Regulation) Act. He said that in addition 20 officers and officials of different departments had been authorized to seize any mineral raised or transported by any persons without any lawful authority. Industries Minister Mukesh Agnihotri said that illegal mining was a sensitive and important issue which needed to be checked at all levels. He said that State Government was committed to stop illegal mining in the State and all departments associated with this should work in coordinated way. He said that pressure was more on bordering districts of the State and more vigil was needed in these areas. He said that Industries Department had taken various steps to check illegal mining in the State and flying squads had been constituted at Sub-Division level. Agnihotri said that 5389 illegal mining and transportation cases were detected during the year 2012-13 and total fine of Rs. 2.20 crore were imposed while 4282 illegal cases have been detected from January 2013 to August, 2013 and total fine of Rs. 2.38 crore was realized. He said that this shows that there had been more checks, detections and recovery of fine during current year and still much needed to be done to stop this unlawful activity completely. Chief Secretary Sudripta Roy said that illegal mining was an important issue for the State as valuable minerals were smuggled to other States causing loss of revenue and minerals which could be used for developing infrastructure in the State. 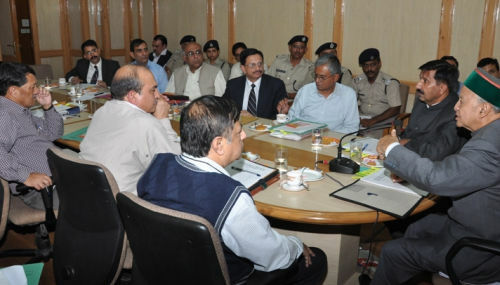 He said that this meeting was convened to take effective steps to check illegal mining and apart from senior officers of all the concerned departments, Deputy Commissioners of border districts such as Solan, Sirmour, Una and Kangra along with Superintendent of Police of these districts and S.P. Baddi-Barotiwala were invited to suggest measures to stop these activities. Principal Secretary Revenue and Industries Tarun Shridhar said that Mining Act and Rules of both Government of India and Himachal Pradesh were strong enough to check these illegal activities and new Mining Policy was framed to meet out the construction needs within the State. He said that check and detection position had been improved in the State as Rs. 8.44 lakh were recovered as fine in July, 2013 while 22.40 Lakh have been recovered in the month of August. S.P. 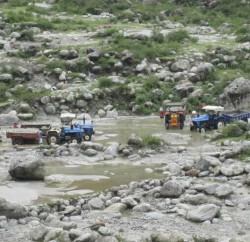 Kangra Balbir S. Thakur informed that 239 cases of illegal mining were detected in Kangra district from first January to 31 December, 2012 and fine of Rs. Seven Lakh was imposed while 592 cases had been detected from first January to 31st August, 2013 and fine of Rs. 26.52 Lakh was compounded by the Police. S.P. Una Anupam Sharma said that 569 cases had been detected and fine of Rs. 46 lakh have been compounded this year itself while only 122 cases were detected in last year and Rs. 8.50 lakh were compounded by the Police. S.P. Baddi S. Arul Kumar informed that Police had challened 311 cases and fine of Rs. 28.99 lakh were realized in last calendar year while 396 cases were challened and Rs. 41.92 lakh fine was realized upto August this year. DGP Sanjay Kumar, Additional Chief Secretary (Home) P. Mittra, Additional Chief Secretary (Forest) Shri Vineet Chawdhary, Principal Secretary to Chief Minister V.C. Pharka, Principal Secretary PWD Narender Chauhan. Principal Secretary Transport Shri Ali Raza Rijvi, PCCF R.K. Gupta, Member Secretary Pollution Control Board Vineet Kumar, Secretary Law Chirag Bhanu Singh, Director I&PR Rajender Singh, Director Industries Mohan Chauhan, State Geologist Indersh Dhiman were present among others officers.